With my love for teaching and all things English, I knew that I wanted to teach high school. But the question remained how would I become a high school teacher? What would I need to do to become certified? There are several different paths that one could take, but generally high school teacher candidates need the following. Elementary school teachers need to cover a wide range of subjects. A high school teacher, however, needs to be an expert on the subject matter that they teach. To do this, one should complete a bachelor’s degree either in education with a focus on their subject area or a bachelor’s degree in their subject area with a graduate degree in education. Of course, some people consider becoming a high school teacher without the traditional education path. In these cases, they need to complete an alternative teacher certification program. These programs vary depending on the state in which they plan to work. It’s also helpful if you have the skills needed to advise an extracurricular activity, such as a sport, yearbook, etc. Before becoming a high school teacher, you should think about the skills and traits that you already have. Are there any skills or traits that you should develop in order to be an effective teacher? Before becoming a teacher, one should gain experience working with children. It could include getting a job at a daycare, volunteering as a Big Brother or Big Sister, or tutoring students after school. Find something that you can do to develop the skills you need to connect with students. In order to gain teaching experience, you should complete student teaching or a similar practicum experience. You’ll also need to undergo fingerprinting and a background check. Determine the specifics needed for your state in order to get your teaching certificate. For example, most states require a passing score on the Praxis exam for your subject matter, too. When you’re ready to apply for your first teaching job, start preparing the necessary documents. Some of the things that you’ll need include a resume, cover letter or letter of intent, a teaching philosophy, and teaching portfolio. 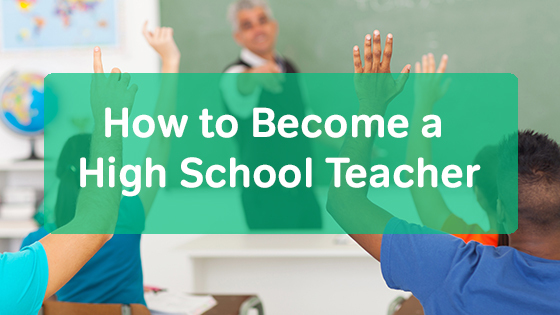 Becoming a high school teacher requires developing the skills and traits needed, as well as completing the necessary requirements. Once you’ve completed these steps, you need to start applying and interviewing for jobs. Find ways to network with teachers and administrators in the area to help you stand out.